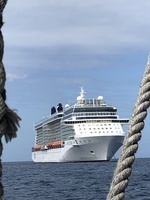 This was our 2nd cruise on Celebrity and on Reflection. We flew out of snowstorms in Mpls. into sunny and warm weather in Ft. Lauderdale the afternoon before the cruise. We booked a ride through the hotel (Best Western Cruise port) to the ship and also prepaid to have them meet us after the cruise to take us to the airport. It was a breeze! The hotel was fine for one night. Nothing fancy but convenient. We arrived at the dock and did not have much of a wait at all and before we knew it we were on board with our glasses of champagne, Big Smiles and heading to the pool! Nice to have carried on our swimsuits! We were on board early enough to enjoy some sun time before having lunch. Having been on The Reflection once before, we knew the layout of the ship and where "our cabin" is located (same cabin as before). Very easy ship to navigate. The ship is Always being cleaned. Our cabin was clean, spacious and had the extra bonus of having not just deck chairs, but loungers too. A shout out to Hasip - our room steward - who was exceptional! We had Anytime Dining. I tried to make daily reservations prior to boarding -- on Celebrity&apos;s website), but it did not "take" except for the first and last day of the cruise. We tried to get a specific time for the other nights so that we would get the same table and servers, but the maitre d&apos; said to just come when ever we want. It was not as efficient as when we were on Reflection a year and a half ago in the Mediterranean. We were able to have the same time each night and after the first night we did not have to wait to be seated -- we were able to just go to our table. On this cruise we did, however, sit in the same area every night and had the same servers. A Big Thank You to our Wonderful Dining Staff -- Russel is Top Notch! "By one get one free" and Always Attentive. Diego helpful and attentive. Randy - Great "wine master". The food in the MDR was mostly very good. Portion sizes varied, so we usually both got an appetizer and one to share. During sea days we had lunch in the MDR. The portions seemed to be larger during lunchtime. We ate breakfast a few times in the MDR and the rest of the time in the buffet. It would be nice if they had some variations in the breakfast items in the MDR - like a special of the day. But the food was always good! We enjoyed the buffet for breakfast and the lunches on port days when the MDR was not open. Lots of variety in the buffet for both breakfast and lunch. Freshly made and good quality food. I enjoyed the ship made ice cream Everyday after lunch -- YUM! Even better with a special topping of Kahlua ;) We had the Premium Beverage package. It is really nice to be able to order almost anything you want and not worry about extra costs. There were a few wines that were higher, and of course any flights, etc. that are not included. We discovered a drink that became our pool favorite - French Caribbean. We found that the quality of drinks did not seem to be the same throughout the ship. We specified we had the Premium Drink package and to use Top Shelf liquor, but don&apos;t think they always did it, especially at the pool bars when the poolside staff took the order. When we went to the poolside bars, I think they did tend to give us the Top Shelf liquor. Issac is an exceptional bartender (near the Theater, and on the last sea day saw him at the pool bar). 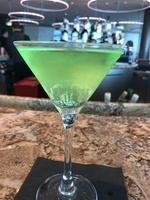 Of course, the Martini Bar is fun and always good! Miss it already! This cruise seemed to have a majority of elderly folks on board. I think Celebrity must have correlated the daily entertainment towards the majority. We really enjoyed the shows in the Theater that the Reflection Team and musicians put on. The guest entertainers were OK, but I would not pay to go see them at home. There did not seem to be a lot going on if you did not gamble or go to an art or jewelry show or auction. The pool music was always good. Service --- GREAT! The staff on Reflection is exceptional in their service. Always a smile and hello when you meet them on the stairs or hallways. Before dinner, the Martini Bar did get a bit busy and service was a bit slower -- but we weren&apos;t going anywhere :) Happily! Ports: We bought 2 Shore Excursions through Celebrity (when they had the really good sale). We did not do a shore excursion when we were in Ft. Lauderdale. We walked around quite a bit up and down the street where our hotel was located, just enjoying the warm weather. Once on-board we stayed on-board - enjoying Reflections hospitality :) Grand Cayman: We tendered here. Had a bit of rain that did not last long. We walked to a beach that was South of the cruise ship. A nice walk 2 12 miles (approx.) each way. It was warm and sunny. The beach was mostly for snorkeling, but there were some sunbathers as well. A bit rough to swim. We did a Tour of Cartagena, Columbia through Celebrity. It was interesting and our guide was very informative. A very enjoyable tour. It was both a bus and walking tour. 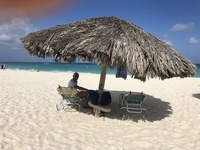 Our next stop was Aruba. This was an overnight, which was a lot of fun. We were fortunate enough to be there when they had the Big Carnaval Parade (8 p.m. to 2 a.m.). After dinner, we walked a long way down the street that runs along the water, where people were lined up waiting for the parade. It was so much fun to see all the local folks with their own tents, lights, food, drinks and music. It was definitely a Big Event. I think everyone on the Island was there! We felt completely safe the whole time. Lots of families, children, parents and grandparents. I watched a couple hours of the parade before retiring back to the ship. The next day we took a local bus to Eagle Beach. The bus was very convenient ($2.50 per person each way). We rented 2 loungers for $10.00 each. We were early enough that we were able to get one of their free huts (bamboo type large "umbrella". If we wanted to, we could rent a beach umbrella for $25.00. It was a very nice beach, lots of soft sand and fairly warm water. This is the first time we had wi-fi, so it was nice to send a couple photos home to the "kids". Our next stop was Curacao. We just did a lot of walking and exploring, Very pretty bridge and buildings and friendly people. Had a little bit of rain, but then the sun came back out and really made things steamy. Bonaire was our last port of call. We took a Double Dip Snorkeling Tour through Celebrity. The boat picked us up right at the pier where Reflection was docked. Could not get any more convenient than that! We went out to the smaller isle near the ship. The crew on the Seacow was Wonderful. Personable and helpful; reassuring for nervous snorkeling novices. The waves were a bit rough, more-so than normal. The water was colder than we expected, so we were shivering when we got out of the water the first time. We were fitted with fins and told how to put on and fit our masks. We were given signs if we needed help or were OK. We were split into 3 groups and had 3 guides. Our guide pointed out different fish and a turtle, diving down to point and then coming up to talk about what it was she pointed at. Always making sure everyone was OK. After getting back on the boat the first time we warmed up a tiny bit and got back in the water for a little shorter time to see some more. This was a very good excursion to go on and I would highly recommend it. After the 2nd snorkel we were treated to rum punch :) It was another good day! My only complaint was that the time on Bonaire was limited. I think all aboard was 3:30. So, after our snorkeling and going back on board to eat lunch, there was not any time to explore the town. We did, however, take a Quick walk through town prior to the snorkeling. This was our 2nd cruise on Celebrity and on Reflection. We flew out of snowstorms in Mpls. into sunny and warm weather in Ft. Lauderdale the afternoon before the cruise. We booked a ride through the hotel (Best Western Cruise port) to the ship and also prepaid to have them meet us after the cruise to take us to the airport. It was a breeze! The hotel was fine for one night. Nothing fancy but convenient. We arrived at the dock and did not have much of a wait at all and before we knew it we were on board with our glasses of champagne, Big Smiles and heading to the pool! Nice to have carried on our swimsuits! We were on board early enough to enjoy some sun time before having lunch. Having been on The Reflection once before, we knew the layout of the ship and where "our cabin" is located (same cabin as before). Very easy ship to navigate. The ship is Always being cleaned. Our cabin was clean, spacious and had the extra bonus of having not just deck chairs, but loungers too. A shout out to Hasip - our room steward - who was exceptional! We had Anytime Dining. I tried to make daily reservations prior to boarding -- on Celebrity&apos;s website), but it did not "take" except for the first and last day of the cruise. We tried to get a specific time for the other nights so that we would get the same table and servers, but the maitre d&apos; said to just come when ever we want. It was not as efficient as when we were on Reflection a year and a half ago in the Mediterranean. We were able to have the same time each night and after the first night we did not have to wait to be seated -- we were able to just go to our table. On this cruise we did, however, sit in the same area every night and had the same servers. A Big Thank You to our Wonderful Dining Staff -- Russel is Top Notch! "By one get one free" and Always Attentive. Diego helpful and attentive. Randy - Great "wine master". The food in the MDR was mostly very good. Portion sizes varied, so we usually both got an appetizer and one to share. During sea days we had lunch in the MDR. The portions seemed to be larger during lunchtime. We ate breakfast a few times in the MDR and the rest of the time in the buffet. It would be nice if they had some variations in the breakfast items in the MDR - like a special of the day. But the food was always good! We had the Premium Beverage package. It is really nice to be able to order almost anything you want and not worry about extra costs. There were a few wines that were higher, and of course any flights, etc. that are not included. We discovered a drink that became our pool favorite - French Caribbean. We found that the quality of drinks did not seem to be the same throughout the ship. We specified we had the Premium Drink package and to use Top Shelf liquor, but don&apos;t think they always did it, especially at the pool bars when the poolside staff took the order. When we went to the poolside bars, I think they did tend to give us the Top Shelf liquor. Issac is an exceptional bartender (near the Theater, and on the last sea day saw him at the pool bar). Of course, the Martini Bar is fun and always good! Miss it already! This cruise seemed to have a majority of elderly folks on board. I think Celebrity must have correlated the daily entertainment towards the majority. We really enjoyed the shows in the Theater that the Reflection Team and musicians put on. The guest entertainers were OK, but I would not pay to go see them at home. There did not seem to be a lot going on if you did not gamble or go to an art or jewelry show or auction. The pool music was always good. Service --- GREAT! The staff on Reflection is exceptional in their service. Always a smile and hello when you meet them on the stairs or hallways. Before dinner, the Martini Bar did get a bit busy and service was a bit slower -- but we weren&apos;t going anywhere :) Happily! Ports: We bought 2 Shore Excursions through Celebrity (when they had the really good sale). Grand Cayman: We tendered here. Had a bit of rain that did not last long. We walked to a beach that was South of the cruise ship. A nice walk 2 12 miles (approx.) each way. It was warm and sunny. The beach was mostly for snorkeling, but there were some sunbathers as well. A bit rough to swim. We did a Tour of Cartagena, Columbia through Celebrity. It was interesting and our guide was very informative. A very enjoyable tour. It was both a bus and walking tour. 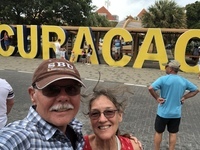 Our next stop was Aruba. This was an overnight, which was a lot of fun. 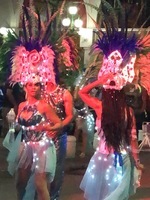 We were fortunate enough to be there when they had the Big Carnaval Parade (8 p.m. to 2 a.m.). After dinner, we walked a long way down the street that runs along the water, where people were lined up waiting for the parade. It was so much fun to see all the local folks with their own tents, lights, food, drinks and music. It was definitely a Big Event. I think everyone on the Island was there! We felt completely safe the whole time. Lots of families, children, parents and grandparents. I watched a couple hours of the parade before retiring back to the ship. The next day we took a local bus to Eagle Beach. The bus was very convenient ($2.50 per person each way). We rented 2 loungers for $10.00 each. We were early enough that we were able to get one of their free huts (bamboo type large "umbrella". If we wanted to, we could rent a beach umbrella for $25.00. It was a very nice beach, lots of soft sand and fairly warm water. This is the first time we had wi-fi, so it was nice to send a couple photos home to the "kids". 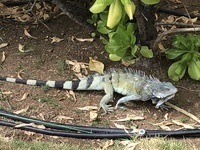 Our next stop was Curacao. We just did a lot of walking and exploring, Very pretty bridge and buildings and friendly people. Had a little bit of rain, but then the sun came back out and really made things steamy. Bonaire was our last port of call. We took a Double Dip Snorkeling Tour through Celebrity. The boat picked us up right at the pier where Reflection was docked. Could not get any more convenient than that! We went out to the smaller isle near the ship. The crew on the Seacow was Wonderful. Personable and helpful; reassuring for nervous snorkeling novices. The waves were a bit rough, more-so than normal. The water was colder than we expected, so we were shivering when we got out of the water the first time. We were fitted with fins and told how to put on and fit our masks. We were given signs if we needed help or were OK. We were split into 3 groups and had 3 guides. Our guide pointed out different fish and a turtle, diving down to point and then coming up to talk about what it was she pointed at. Always making sure everyone was OK. After getting back on the boat the first time we warmed up a tiny bit and got back in the water for a little shorter time to see some more. This was a very good excursion to go on and I would highly recommend it. After the 2nd snorkel we were treated to rum punch :) It was another good day! My only complaint was that the time on Bonaire was limited. I think all aboard was 3:30. So, after our snorkeling and going back on board to eat lunch, there was not any time to explore the town. We did, however, take a Quick walk through town prior to the snorkeling. We Love this cabin! On the slant of the hump that sticks out. It has plenty of space and storage. The only complaint is that I think it needs a new mattress. An egg crate mattress pad was already on the bed. I&apos;m hoping that when they Revolutionize Reflection they replace the mattresses to better quality ones. Double Dip Snorkeling on Seacow. Very good company. Took good care of novice snorkelers. Water cold though. Bus and walking tour. Guide very informative.